Carpeting upstairs has been replaced with laminate wood flooring. There is no longer carpet in this house. Bright, Beautiful, Accommodating and Clean. 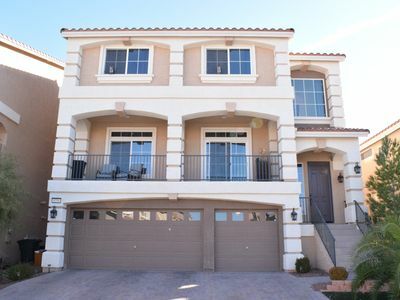 This 3000 sf home offers 4 Bedrooms and 3 Bathrooms. 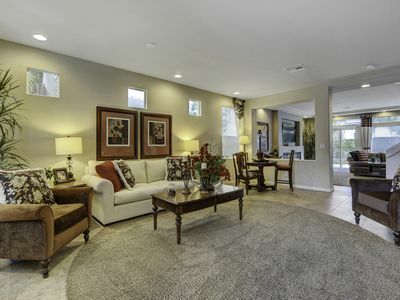 Guests will delight in this completely remodeled home with sparkling pool and spa and awesome Entertainment Room. 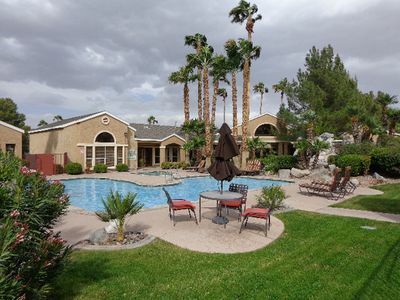 The Perfect Las Vegas Getaway Home for a large family, business associates or group of friends located just minutes from the heart of the Las Vegas Strip. 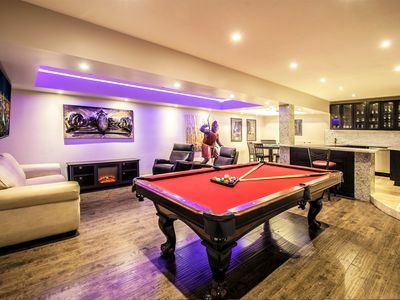 This home features 4 bedrooms, 3 full bathrooms, man cave, pool, spa and too many TVs! 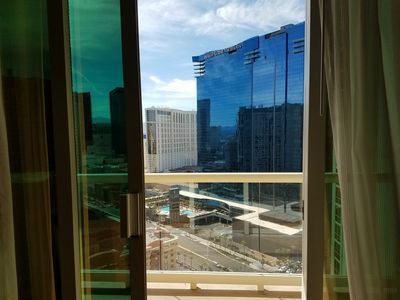 This beautiful vacation home has been designed and remodeled inside-out to offer travelers a luxurious, clean and accommodating stay central to the Las Vegas Strip. 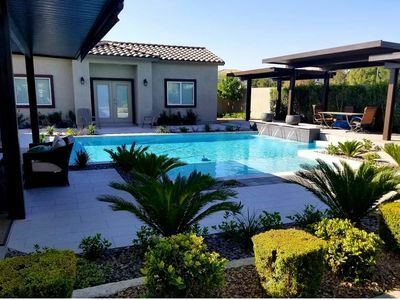 Guests can enjoy a newly redesigned backyard desert oasis landscape and a refreshing, remote controlled pool with attached in-ground spa and LED lighting. 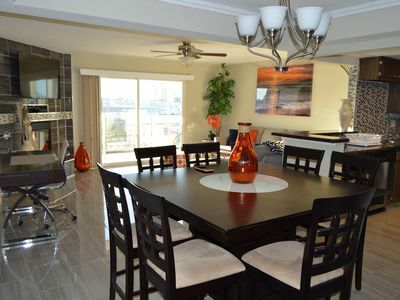 Take in your morning coffee under the covered patio with fans, dining table and sectional. 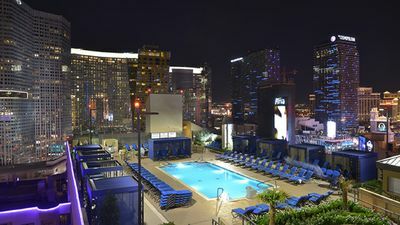 Enjoy the sunsets at the fire-pit table and soak up the Las Vegas sun in one of the many lounging chairs. Cook your dinners on the BBQ grill. Completely remodeled in 2016. 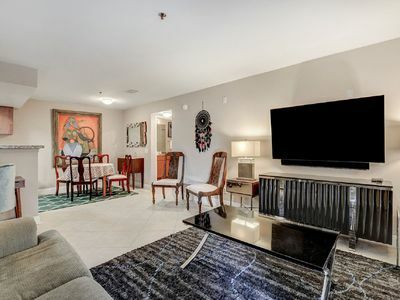 All new windows, doors, accent lighting, wood cabinetry, natural stone and wood flooring, granite counters and tabletops throughout, fresh paint, 8 large LED Smart TVs, designer leather furniture and high-end mattresses. 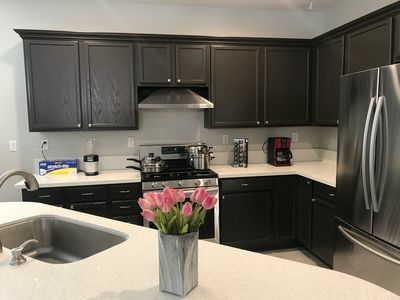 House equipped with 3 new heating & air conditioning units, air purifiers in each bedroom, new pool and spa equipment, resurfaced pool and spa, LED pool/spa lighting and complete new patio and pool deck. State-of-the-Art Security System with automated door locks and environmental controls adjustable to suit guest's preference. Enjoy the use of an awesome entertainment room. A 650 square foot private room offering guests the ideal 'Man Cave' with a dedicated AC/Heating unit. The CAVE offers ambient multicolored LED lighting, a pool table, poker table, full wet bar equipped with complete collection of stemware, ice maker, beverage center, wine cooler, dishwasher, accent lighting, 2 LED TVs - 70" & 50", queen memory foam sofa sleeper, 3 bar stools, and 2 electric reclining leather theater chairs. 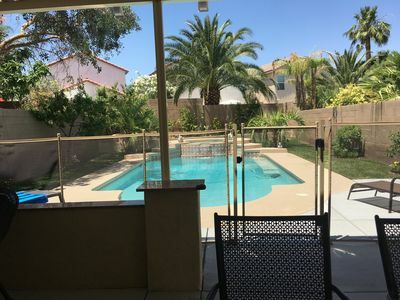 The property has a great backyard with beautifully landscaped private space with large pool and spa surrounded by large stucco walls offering complete privacy. In addition, there is a shaded eat-in area with lounging sectional, separate lounging chairs, and fire pit table. A large covered patio awaits with ceiling fans, dining area, BBQ grill and outdoor seating. Pool, spa, heater and pool lights all controlled via convenient, easy-to-use hand held remote control. 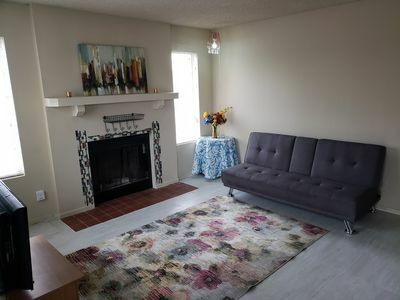 Guests can enjoy dining in various areas throughout the house: 8 guests in the formal dining room, 6 guests in the breakfast nook, 7 guests in the game room, and 6 guests under the covered patio. Sleeps up to 16 guests comfortably with 4 beds, 3 queen sofa sleepers, 2 twin sleeper ottomans and 1 full sleeper sectional. 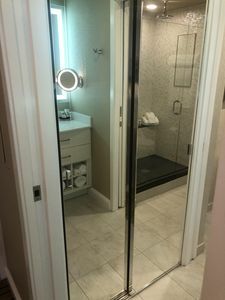 One bedroom is located on the ground floor with a queen size bed and has a newly renovated bathroom right across the hall. 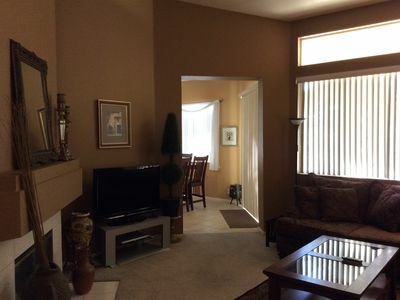 Three additional bedrooms are located upstairs. The upstairs bedrooms feature a queen and a king size bed, ceiling fans, and privacy shutters. 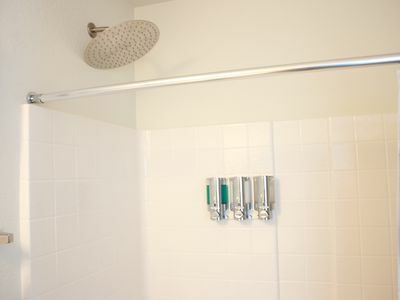 A newly renovated bathroom with tub-shower combination is just outside the hall. 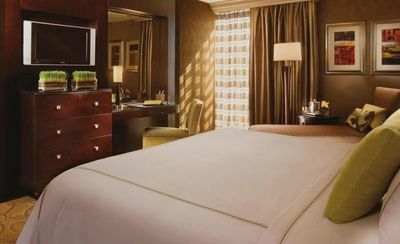 The master has one king size bed with a queen size sofa sleeper and a fully upgraded private bathroom. 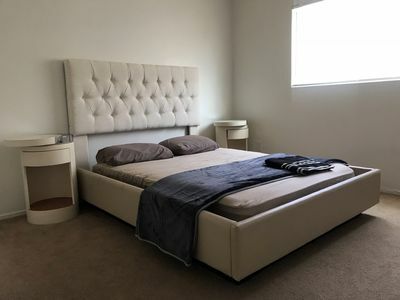 All bedrooms feature large LED Smart TVs and are furnished with new, high-end memory foam mattresses offering various degrees of firmness to best suit guest preferences. For larger parties, the home also offers guests the comfort of memory foam mattresses on 3 queen pull-out sleeper sofas and 2 twin pull out sleeper ottomans. An additional leather sectional with ottoman can serve as a full size bed. Enjoy the use of an extra-large capacity front loading washer and dryer, 2 dishwashers, a large side-by-side refrigerator with ice maker, 2 beverage centers, 1 wine cooler, 1 dedicated ice maker, 8 TVs with DirecTV choice package with NFL Sunday Ticket, 4 electric leather recliners, free WIFI and Optional Maid Service. 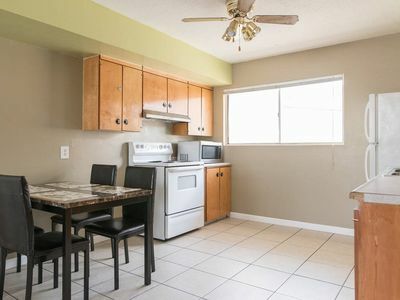 This home offers fresh linens and towels for each stay, as well as a fully stocked kitchen with cooking utensils, all new appliances, pots, pans, extensive stemware (beer, wine, cocktails), cups, glasses and dishes. 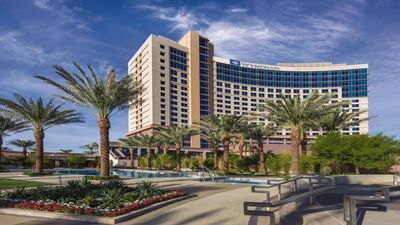 Enjoy your vacation at Westgate Las Vegas Resort & Casino. 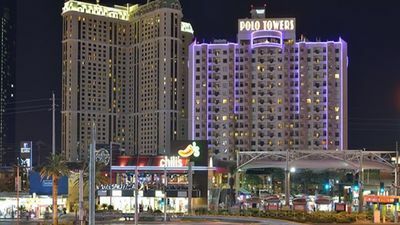 Your suite on the strip!